Have you ever stood watching for your suitcase at the airport luggage carousal and regretted choosing a black one? When searching for new luggage I realized that one brand stood out in every store that carried them. Heys USA make excellent hard shelled suitcases with vibrant designs. Michelle from The Shaker of Salt contacted the company and told them she would like to get together with some other bloggers to give one of our lucky readers a piece of their luggage they were excited to work with us. I know personally I have had my eye on a hard shelled vibrant colored suitcase for a while now. My current suitcase doesn’t technically fit the size dimensions to go on board (I do bring it anyway) but it is ratty and gross and I hope that I don’t bump into people at conferences and blogging events when I have my suitcase with me. Plus this one is big enough not only for my stuff but to pack some things for the dogs as well. Can’t forget that they need space to when you travel with your dog! If you are in the same position I am in (ok maybe you aren’t going to be staying up late tonight packing that ratty old suitcase so you can pack for a trip tomorrow.) 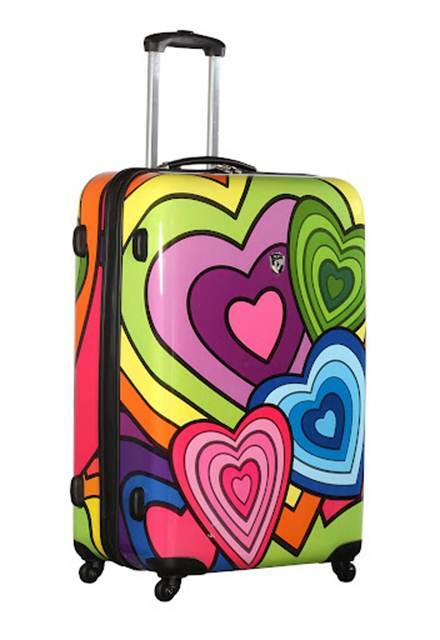 You have a chance to win this 30″ Heart Tempo Suitcase! You have no idea how much I would love to be packing such a nice (new) suitcase tonight. The Heys USA NA603-30 Hearts Tempo 30 inch Spinner is ideal for a 7-10 day trip. The packing shells are both durable and flexible so that when under stress, they flex to absorb the impact and then afterwards flex back to its original shape. Novus Art collection’s utilize 360 degree spinner wheels that are specially made in Japan. These wheels allow for fluid motion, that make the luggage seem like it is gliding on its own power. It also has a push-button telescopic handle system, and has a fully lined interior with a divider. Built-in lock is TSA approved, keeping your valuables safe. This is a new, Factory Boxed Product. Factory Direct Luggage is an Authorized Dealer of Heys USA. A very colorful suitcase. I used to work the baggage service office when I worked in the airline business. This one certainly sticks out. Good luck to everyone!! !